Welcome! Please log in or Sign Up to begin filing. Forget your Email Address or Password? We are now processing the 2018-2019 TAX PERIOD. File your IRS Form 2290 Online electronically, save time and money, and reduce preparation and processing errors. Submit your 2290 return online and get your IRS Form 2290 Schedule 1 through our website within minutes. No more waiting in line at the IRS or waiting for it to come in the mail! Vehicles that are used exclusively for the transportation of products harvested from forested sites (logging vehicles) are now supported. New to 2290asap? Please Sign Up to begin filing - signing up is Free! Why sign up? So we can post your IRS Form 2290 Schedule 1 receipt directly to your account! You will receive an email when it's ready. Then you just log in from the comforts of your home or office and print your schedule 1. We offer this service to save you time waiting at the IRS, and then waiting again to get your IRS Form 2290 Schedule 1. What's more, you can start your 2290, then, if you need to continue later, you can sign back in and complete your filing at a later time. 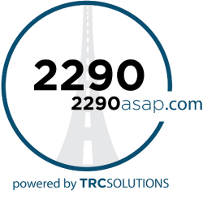 Convenient, simple and quick to complete, that is 2290asap.com! Remember that all carriers with 25 or more vehicles with registered gross weights of 55,000 pounds or more must electronically file Heavy Vehicle Use Tax Form 2290. Note: A filing (or return) is completed once you receive your schedule 1, generally within minutes. Additional schedule 1's filed throughout the year are considered new filings, just like the old paper form. Follow these steps to complete your filing. Click completed steps (highlighted in green) to make changes. © 2007-2019 2290ASAP. All Rights Reserved.